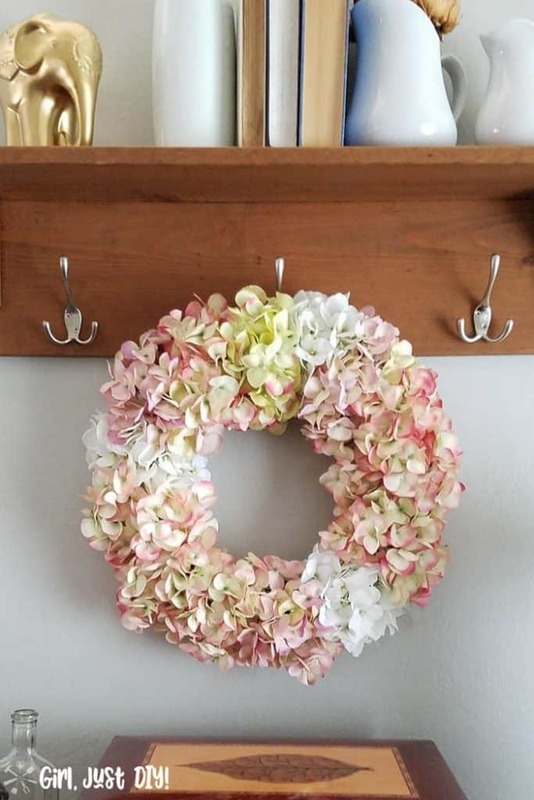 DIY Hydrangea Wreath - Girl, Just DIY! I’ve wanted a Hydrangea wreath for the longest time. It’s funny that I’ve made so many other types of wreaths but not yet the one I wanted most. Until now, I’m glad I didn’t wait any longer because this will be perfect for spring. I really wanted a hydrangea wreath made from the beautiful dried flower heads. But since I don’t have a hydrangea plant I went the next best route. 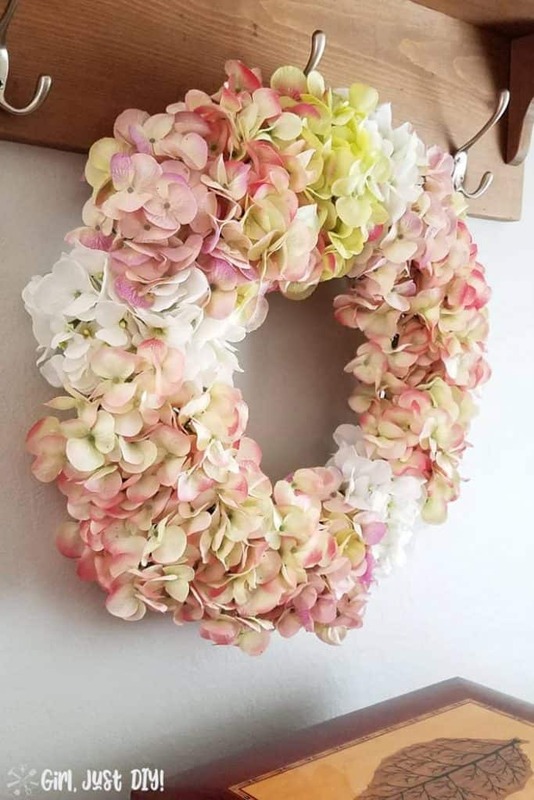 I made my DIY Hydrangea wreath with beautiful silk flowers. It will last much longer and it’s sturdier when stored. 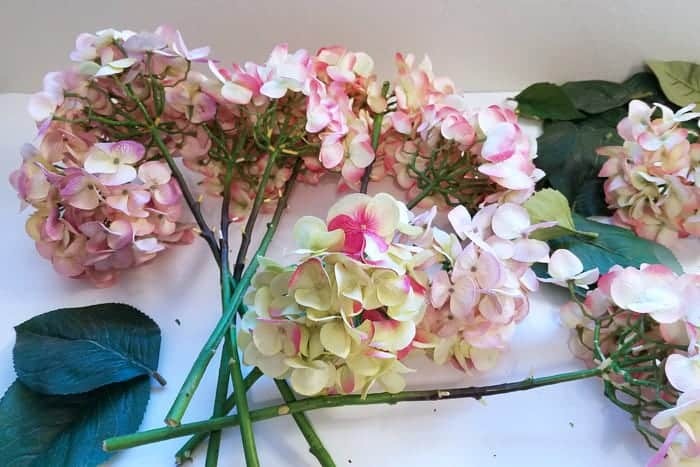 I got a huge bunch of hydrangea stems from a friend at her garage sale after a pipe burst and caused major flooding in her house. They had to gut the house and she decided it was time to change up her decor. That was many years ago I’ve loved them in vases but the plastic coating on the stems was starting to break and shed. It was really bad as I was making the wreath. 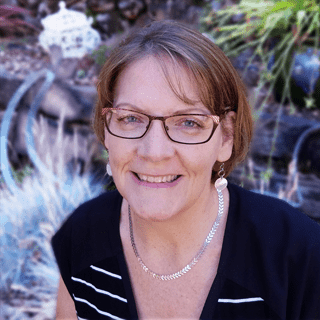 This page contains links to products, if you purchase something after clicking on my link I may earn a small commission (at no extra cost to you). 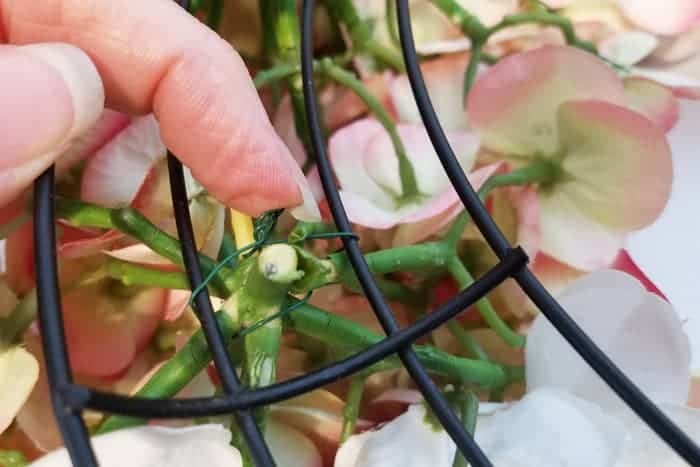 Start by removing the flowers from the stem with wire cutters. 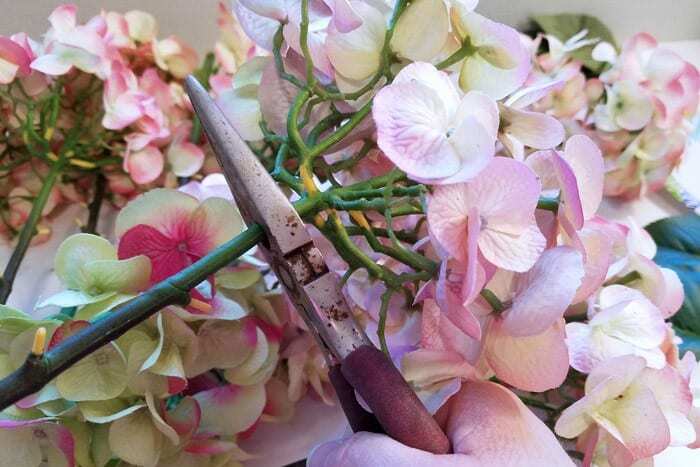 Snip 8″ pieces of floral wire for each of the hydrangea flowers. 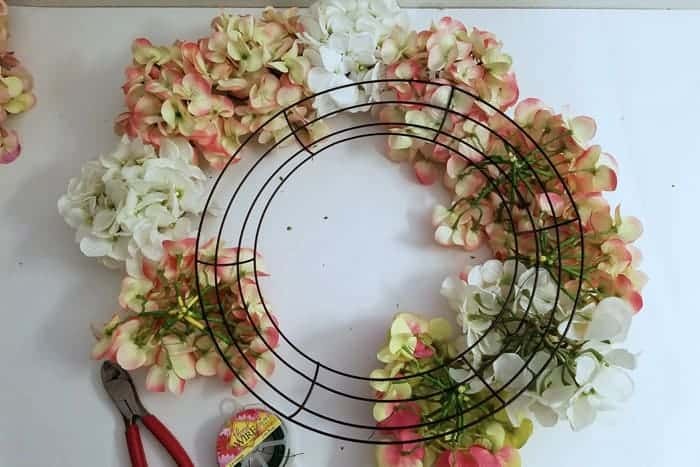 Determine if you’ll have a color pattern on your hydrangea wreath and set them in order so they’re easy to grab as you work. 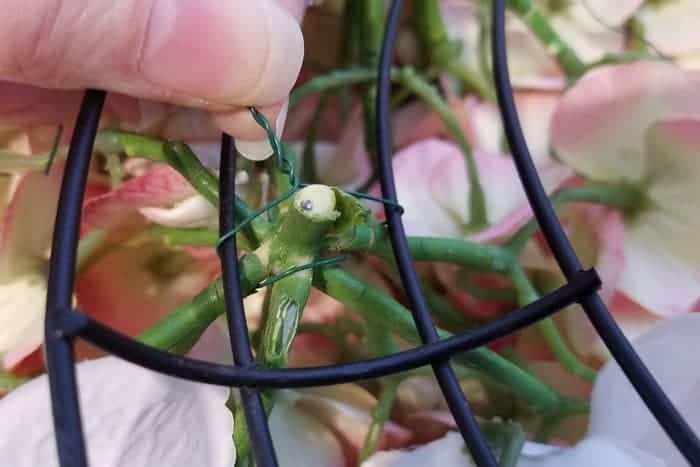 Position the first flower head so the short stem pokes between the two center wires and to the back. 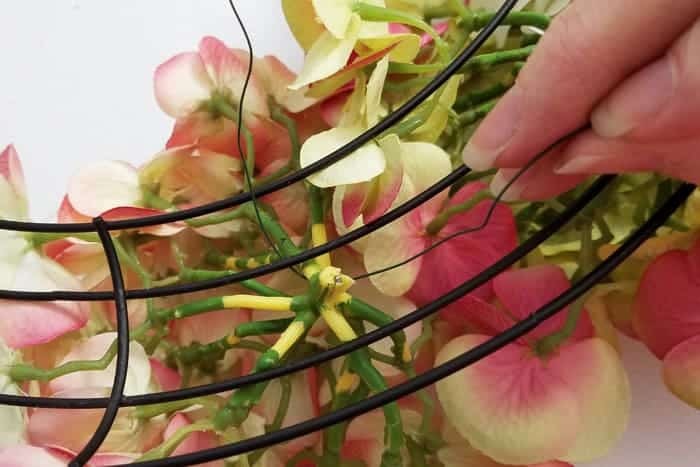 Fold the floral wire in half. 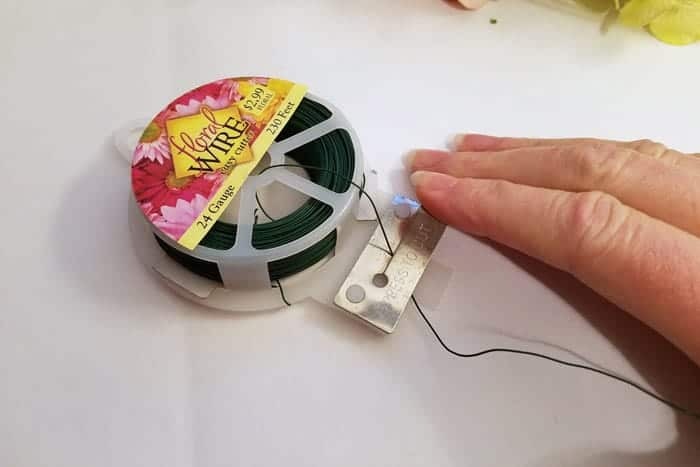 Slip one end of the wire under a side stem and then around and over the wreath wire. Do the same on the left side and then twist both ends of the wire tightly together as shown below. When the wire is twisted tightly together snip it to a length of 1/2″ and fold it over so no sharp edges are loose. Check for spacing as you go and keep working around the wreath until you’ve attached all hydrangea flowers to the wreath form. You’ve just completed your Hydrangea wreath! All you have to do now is determine where you want to hang the beauty and enjoy it. 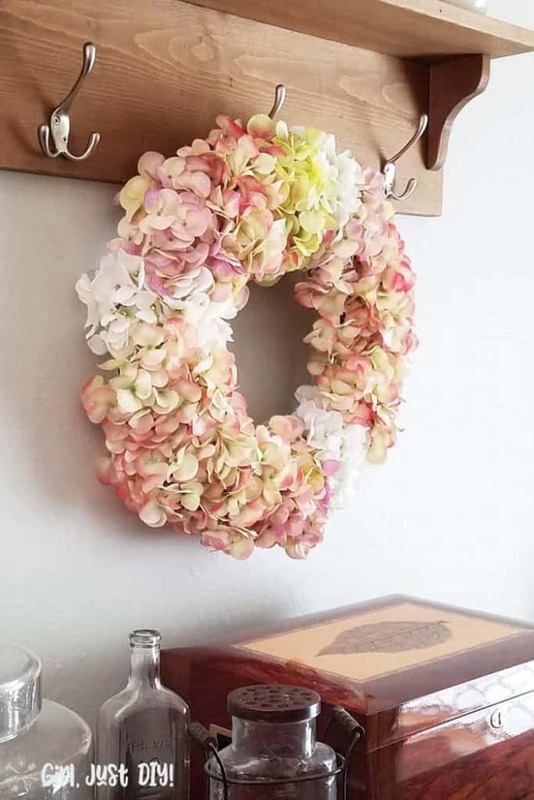 You can hang your new beautiful hydrangea wreath from a wreath hanger using some pretty white satin ribbon, or on a hook like I have mine. I love being able to see this pretty new wreath from my kitchen! 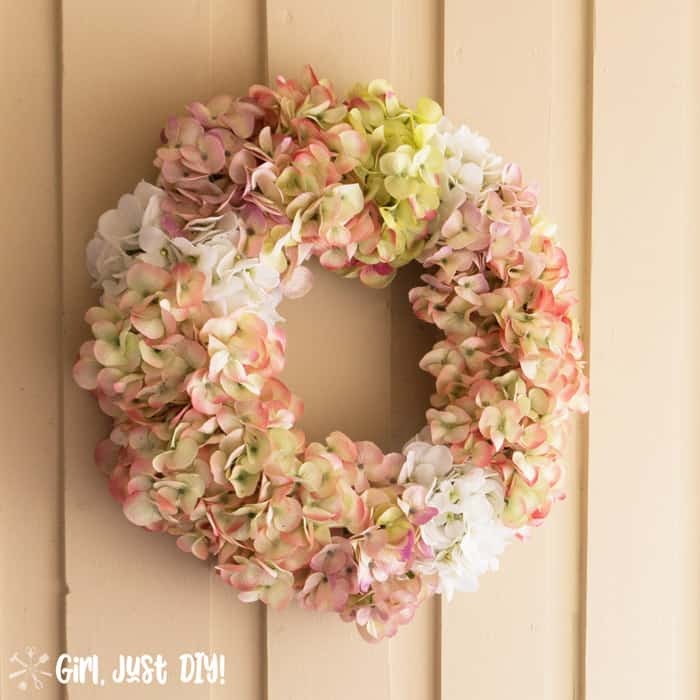 OK Girl, now go DIY yourself a beautiful Hydrangea Wreath! That is sooooo pretty and has me longing for spring!!! I may have to make one to hang on the fireplace!